NI FISHERIES Minister Michelle O’Neil officially opened the new £300,000 fish market and refurbished ice-plant facility in Ardglass. The Minister was visiting the County Down port on Wednesday 24 April as part of its 200th anniversary celebrations in 2013. Fisheries Minister Michelle O’Neill officially opened a new £300k fish market and ice plant facility ar Ardglass Harbour. Looking over the new facility are also Kevin Quigley, NIFHA Chieef Executive, and Terry Jarvis NIFHA Chairman. (Photo by Aaron McCracken/Harrisons). The new fish-market has been designed to cater for the current and projected needs of the Ardglass fishing fleet which, in terms of vessel numbers, has expanded significantly in recent years with a local fleet of 38 vessels. The Minister also took the opportunity to view the recent £110,000 investment in the port’s ice-making facilities which provides port users with an efficient ice supply critical fro maintaining good care of the catch. Speaking at the event, the Minister said: “The new projects at Ardglass harbour, to which my Department has been able to contribute through the European Fisheries Fund, will improve the quality of the infrastructure required for our fishing industry to continue to operate as well as provide consumers with high quality seafood. “This continuing DARD support for the Fishery Harbour Authority, in developing and improving fishing port facilities, serves as recognition of the confidence that government has in the future of our fishing industry. The Minister went on to thank the Harbour Authority for the invitation to visit Ardglass in what was a very significant year in the harbour’s history. 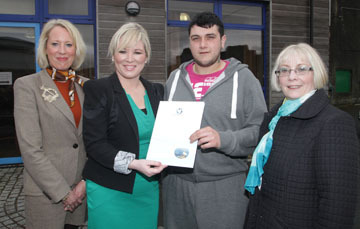 DARD Minister Michele O’Neill presents a certificate to fishery trainee William Morrice. Included are Dr Lynn Gilmore, Seafish, and Marritta McGuirnan, Training Officer with SFITraining. As part of the visit, the Minister also took the opportunity to congratulate the successful graduates from the newly launched ‘Introduction to Commercial Fishing Scheme’ geared towards young people who wish to take up a career in the local fishing industry. The new fishmarket includes two chill rooms and a central handling area, with new toilet and shower facilities, and extra rooms for fishermen to relax in. Last year Ardglass was the top gross landing port in Northern Ireland for prawns, the main catch, which fish is now a much less significant part of the work of local boats. Mackerel and herring pelagic vessels also land in Ardglass and service the two processing plants in the village. Mr jarvis then thanked the project team of David Lindsay and David Smyth. McGivern Construction won the contract, and the ice plant was supplied by Ace Refrigeration. Ardglass Councillor Dermot Curran, Chairman of the Tri-Fisheries Working Group, added: “I would like to congratulate everyone who made this project possible. It is a great improvement to the harbour and will help bring more business to the area. 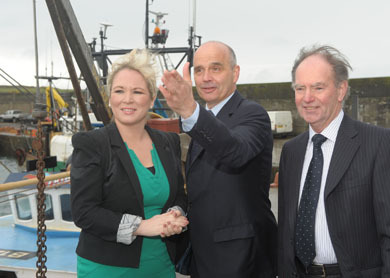 Recently Margaret Ritchie MP hosted MEP and shadow Fishing Secretary visits to Ardglass. We have around 1200 fishermen in Northern Ireland and they will all benefit from this when visiting the port.